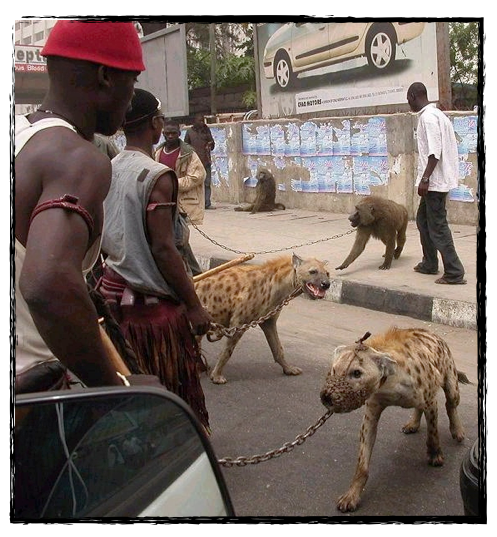 Yes, those are Spotted hyenas; the most aggressive and the largest of the four different hyena types. That's a pretty big predator to have leaning up against you! Did you know that hyenas have the strongest bite force of any mammal? They crush bones. A five-hour old hyena pup can crack the leg bone of an antelope. Yikes. So why do the Hyena Men of Nigeria even have hyenas? 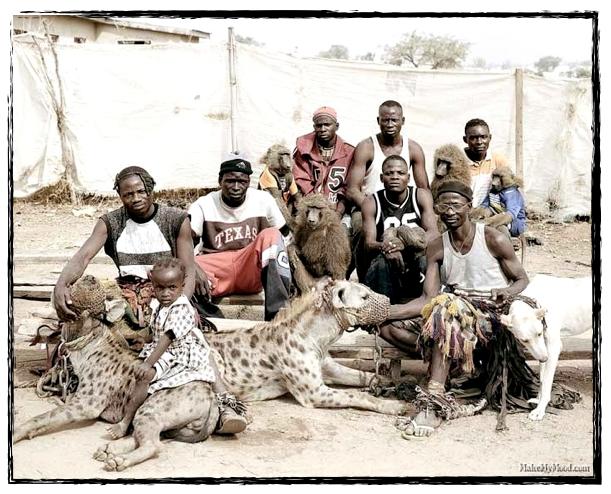 Though reported in an African newspaper that these guys were "bank robbers, body guards,...and debt-collectors", they are known to locals as Gadawan Kura...hyena handlers. 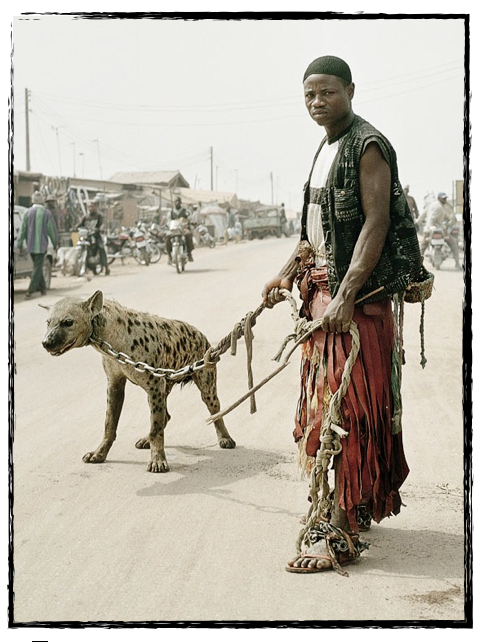 Hyena Men are really traveling performers who sell traditional herbs, potions and charms. They use their hyenas, baboons, and a few rock pythons to attract and entertain crowds. 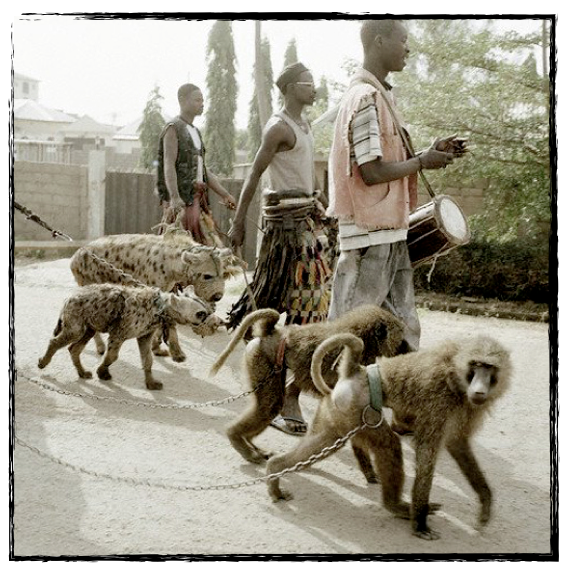 The baboons do somersaults and dance to the beat of drums; the hyenas mesmerize the onlookers. 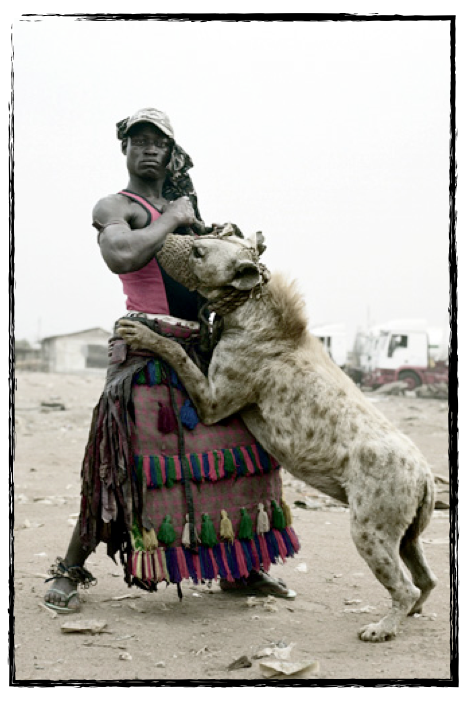 The Hyena Men even sell charms to people who want to pet the animals without fear. A self-generating business! Hyena Men claim they can also capture wild animals for others. How? They track the animal, stun it with smoke mixed with certain herbs, give it charms to make it tame, and bring it back to the customer. These guys don't mess around...they're tough. And smart. Business is booming... and booming well enough for these Hyena Men to establish for themselves yam, maize, and cassava farms; an impressive retirement plan for wandering minstrels. And think of the stories they'll have to tell! Thank you, Lois and Audrey...i am fascinated by it, too. This is entertaining to read about but also saddening, as it is clear mistreatment of animals. Especially wild animals that deserve the respect of being left alone by humans who wish to exploit them and abuse them. It's not fair that these wild animals have to be chained up to make a buck. They deserve better, common decency and respect. Great post, and great pics. But I do agree with Anonymous; animals aren't entertainment, especially not when a muzzle and chains are required to "make them safe". Wild animals don't belong in a city, let alone in close proximity to humans. Sad to see this happening, but thanks for bringing it up. This is awful - these animals are suffering. They spend their lives doing trick, wrapped in chains at the mercy of humans. You know these animals are beaten into submission. My heart aches for these beautiful creatures.